So I quite randomly came across this little (58 pages!) story, and decided to download it on to my Kindle app. As you know, I'm not really a horror reader any more (but I had been a compulsive horror reader as a teenager), but I thought... hay, it's zombies right? I can do this! So, I sat down over a couple of hours and read this apocalyptic book. It is written in first person from the perspective of Dave, and catches him at work when the zombie apocalypse starts. The rest of the novelette follows Dave as he tries to negotiate through the hysterical city to get back and save his wife and two girls. It's a simple enough premise, and pretty much the same premise we see in most zombie movies and books. The zombie genre usually has little or nothing to do with zombies in themselves (although the Warm Bodies movie which is being released in Feb 2013 seems to be breaking that convention) but more to do with the survivors who try to continue living in a lifeless world. So what did I think. Well, if I'm honest I found the first person narrative unbelievable. It was not the pace of the narrative that did it, I would expect the pace to be quick for such a short story, but I found the depth of character lacking and so I could not empathise with Dave. In fact, I found that I preferred Laura and her motivations and character rather that Dave, and she barely featured in the story. 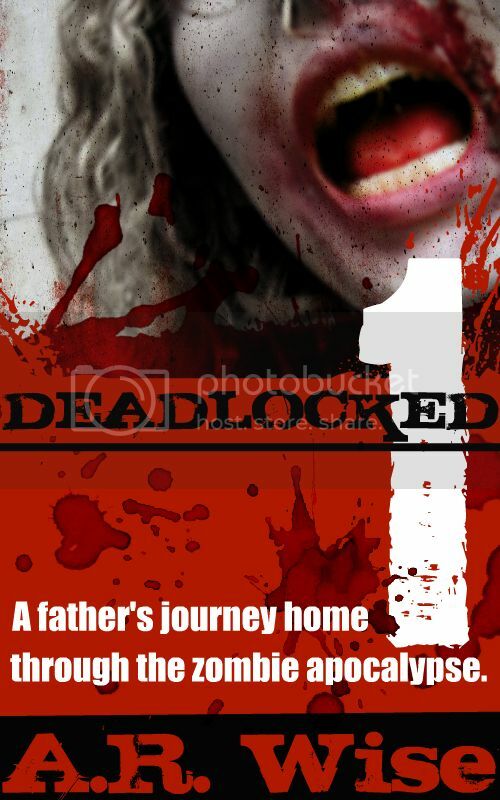 Deadlocked is the first of a series and so I think I will go back to see just what Wise has up his sleeve and whether his character development and depth improve as the writing gets longer. I have a distinct feeling that the rest of his novelettes (it seemed too short to be considered a novella, but I may be wrong as I don't have a word count) will see him start to hone his craft. I think it was a brave first attempt at delivering the theme to an audience and so the author should be commended; but the writing, in my opinion, tried, desperately, to claw at emotion and it just could not deliver on that front. There were times that I did feel the fear of the characters, but those came few and far between and when I read a story... I want to feel too. Interestingly enough, the end of the novelette features an 'Authors Note'. In this note the author tells us what he aspired to create, and why he did certain things. All I will say on this point is that it took away the mystique from the book and its ending. I have always been of the opinion that it is not for the author to tell us what he or she meant to do, but for the reader to decipher what the author did for them; if the author has to tell us what he or she had intended, it insinuates that he or she did not accomplish what they set out to do (as they're having to explain to us afterwards). So overall, I'm glad that I had given this book a read, and it does make me curious as to how the rest of the books will pan out, and I will get around to reading the others eventually. I'm currently reading World War Z - so it seems that I'm on a zombie kick right now, haha! Please leave a message after the tone! Stephen King movies are making a Comeback! Orisi; (noun): opinionated, officious, optimistic, obsessive, obscure, obnoxious and of course obsolete. Audiobook, book and movie blogger. In a little more detail - a British expat, living and thriving in the UAE.